How to make homemade chicken soup. The easiest recipe ever. 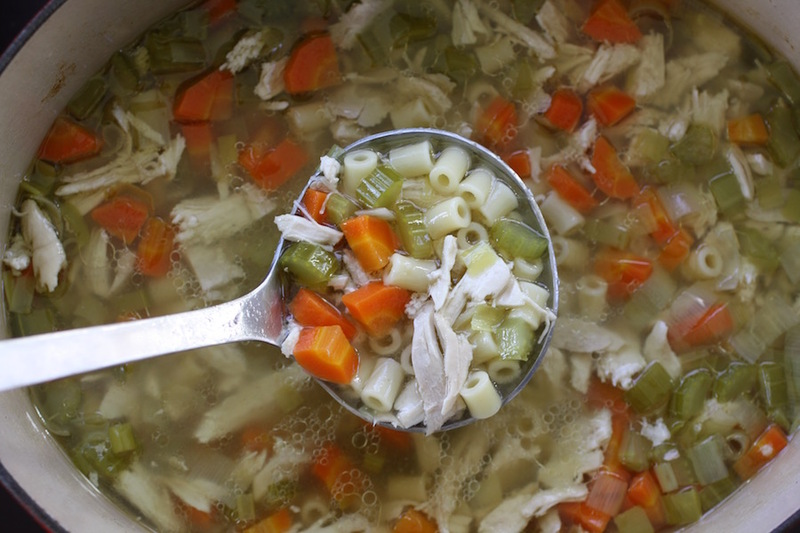 Of all the cozy comforts, homemade chicken soup is at the top of the list. While there are a handful of store-bought chicken soups that satisfy well enough (maybe, sorta), a version made from scratch is the only foolproof answer to anything that ails you. Because when it comes to chicken soup, simple is best. My simple homemade soup recipe won’t have buying multiple chicken carcasses or spending hours in the kitchen. In fact, it’s easy enough that the kids can even help — not that you’ll need it. Related: Healthy comfort foods to get you through the winter without an extra 15 pounds. The technique for my easy chicken soup recipe is twofold: First, you make a yummy broth from chicken and vegetables. Then, you slice more veggies and toss them into the broth with pasta and the cooked chicken meat. Here’s the full tutorial on how to make homemade chicken soup. Read it once and you’ll already have it down. 1. Cut 2 of the carrots, 2 stalks of celery, and the onion into large chunks. Put the vegetables, chicken, 2 teaspoons salt, 1 teaspoon peppercorns, bay leaf, and thyme into a large stockpot. Add enough water to cover the chicken by about an inch of water (this should take approximately 7 cups). PRO TIP: You can also use a mixture of homemade or store-bought low-sodium chicken broth and water for a bit of extra flavor — though, for the record, I never bother. 2. Set the pot over medium-high heat. Bring to a boil before reducing the heat to bring down to a simmer; cook for 25-30 minutes or until the chicken is cooked through. Check it from time to time and, using a large spoon, skim off any foam that has formed on top. 3. Once the chicken is fully cooked, turn off the heat and, using tongs, carefully transfer the chicken pieces to a baking sheet or large bowl to cool. Then carefully strain the broth through a fine-mesh strainer set over another bowl or the pot in which you plan to finish the soup. Be sure to press down on the veggies to get all those tasty juices before discarding them. PRO TIP: At this point, there will be a bit of fat in the homemade broth — a good thing, if you ask me. If you’d like to get rid of some of this, though, chill the broth in the refrigerator so that the fat solidifies on top, then scrape some off. Related: How to roast chicken perfectly: Tips for mastering the ultimate comfort food. 4. Slice or chop the remaining carrot and celery stalk and the leek — how big is up to you — and add them to the broth. Simmer for about 15 minutes. In the meantime, remove the skin from the cooled chicken and shred the meat. You can also give the meat a quick chop to make it easier for little eaters. I reserve 2 heaping cups of chicken for the soup, and save the rest for sandwiches or salads. 5. Bring the soup up to a boil and and stir in the pasta. Cook with the vegetables at a low boil for another 10 minutes or so, until the pasta and vegetables are cooked through. Add the reserved chicken meat to the soup, stirring a few times and cooking until it is warmed through. Season with salt and pepper to taste. 6. Garnish with fresh parsley, lemon juice, and/or a drizzle of good olive oil. Give yourself a silent fist pump for being the kitchen goddess that you are! 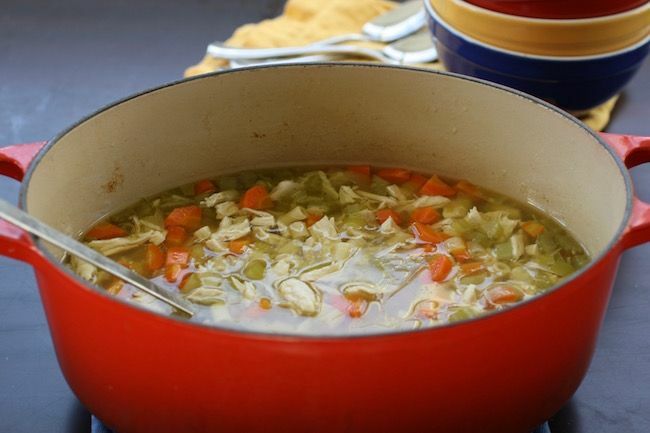 Once you get the hang of the basic version, you’ll find that it’s super easy to add a little of this or a lot of that to boost the flavor of your homemade chicken soup. Here are my favorite ideas. — Add a parmesan rind when making the broth (in step 1 above), and finish the soup with shaved parmesan on top. PRO TIP: Whenever you finish a block of Parmesan, throw the rind in a plastic baggie and store it in the freezer for exactly this purpose. It’s so worth it! 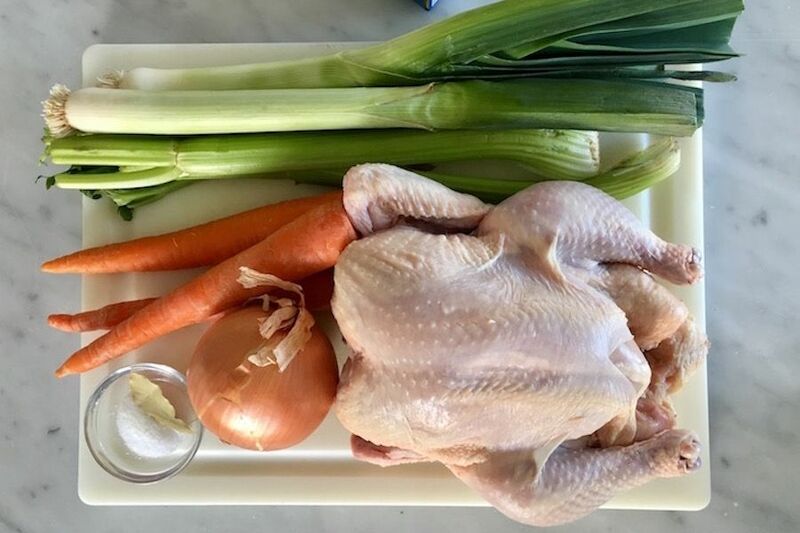 — If you have extra time, brown the chicken in olive oil before making the broth to give your soup a deeper, chicken-y flavor. 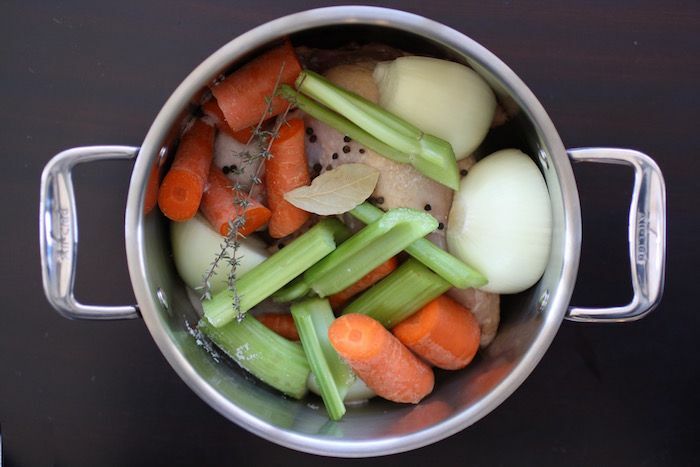 — Save the wings or extra bones from a roast chicken, and add them when making the broth (in step 1 above). This will also impart a more rich flavor, because the more chicken and chicken bones, the bigger the taste.